Seventh generation of the globally successful ambassador for driving pleasure in a premium midsize car. 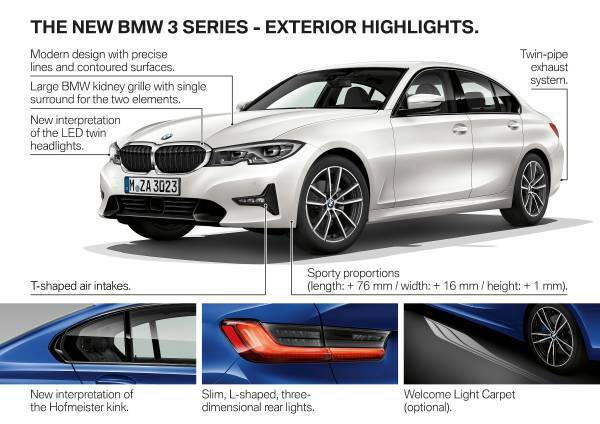 New BMW 3 Series Sedan benefits from significantly enhanced sporting prowess, a new design language, extensive refinements to its premium ambience and trailblazing driver assistance, control & operation and connectivity technology. World premiere in October 2018 at the Mondial de l’Automobile in Paris, market launch from 9 March 2019. New powertrain technology with higher output, greater pulling power and optimised efficiency. Six engine variants available from launch: Four-cylinder petrol models, four-cylinder diesels, plus six-cylinder diesel unit β with outputs ranging from 110 kW/150 hp to 195 kW/265 hp (fuel consumption combined: 5.8 β 4.2 l/100 km [48.7 β 67.3 mpg imp]; CO2 emissions combined: 132 β 112 g/km)*. 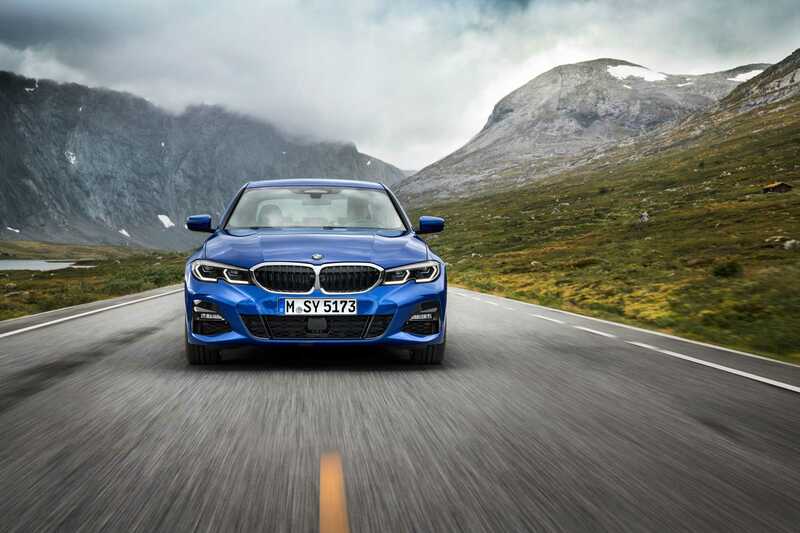 Intelligent all-wheel drive available from launch in the BMW 320d xDrive Sedan (fuel consumption combined: 4.8 β 4.5 l/100 km [58.9 β 62.8 mpg imp]; CO2 emissions combined: 125 β 118 g/km)*. Over the course of the year, an ultra-sporty BMW M Performance version and an extremely efficient model with plug-in hybrid drive system will be added to the range. Noticeably sharper driving dynamics courtesy of extensively upgraded chassis technology, new damper technology, stiffer body structure and suspension mountings, wider tracks, minimised weight, a low vehicle centre of gravity and even 50 : 50 weight distribution. 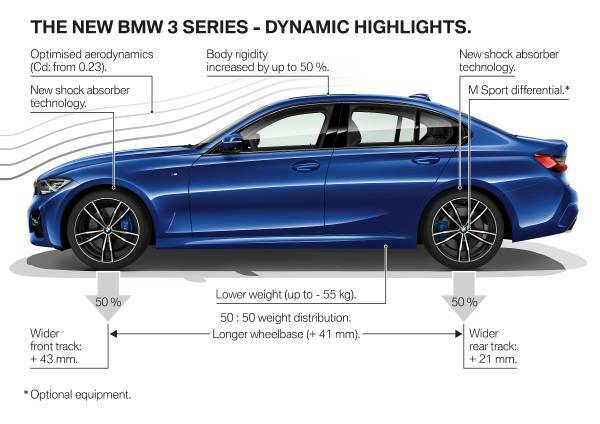 Range of chassis options expanded to give extra sporting ability: M Sport suspension with lowered ride height, Adaptive M suspension, variable sport steering, M Sport brakes, electronically controlled M Sport differential for fully-variable locking effect in the rear differential, up to 19-inch light-alloy wheels. 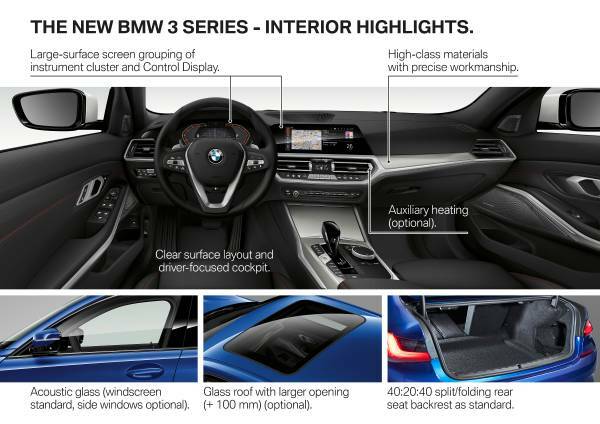 New interpretation of the familiar BMW sports sedan look uses the brand’s new design language. Clear lines and taut surfaces showcase the car’s modern aesthetic, sportiness and emotion-packed presence. Advantage, Sport Line, Luxury Line and M Sport models enable precise individualisation. Optimised aerodynamics. Drag coefficient (Cd) reduced from 0.26 to 0.23 (BMW 320d). Progress underpinned by features including active air flap control, Air Curtains and an almost completely sealed underbody. Standard specification gains full-LED headlights and stylishly darkened LED rear lights. LED headlights with extended features, Adaptive LED headlights with BMW Laserlight for non-dazzling high beam (with a range of around 530 metres) and LED front foglamps available as options. Greater emphasis on driver focus and refined premium interior ambience. Clearly structured controls, precise use of forms and high-quality details convey modern dynamism and exclusivity. More shoulder and elbow room in the front seats, rearward visibility significantly improved, rear compartment easier to get into and offering greater legroom, boot capacity of 480 litres with better usability than the predecessor model. Folding rear seat backrests split 40 : 20 : 40 as standard. Significant increase in comfort, premium ambience and individualisation thanks to extensive additions to standard specification and innovative options. Newly designed sports leather steering wheel with multifunction buttons, new panel of buttons for light functions. New, classy design for the gear selector and the control panel around it on the centre console β which includes the iDrive Controller, start/stop button, the buttons for the Driving Experience Control switch, plus the now electrically operated parking brake. LED interior lights come as standard, ambient lighting with Welcome Light Carpet as an option. Radio Professional with six speakers as standard, Harman Kardon surround sound system with 16 speakers optional. Two USB ports and Bluetooth interface as standard, telephony with wireless charging available as an option. Newly designed seats for the driver and front passenger, optimised seating comfort in the rear, new optional Vernasca leather trim. High-quality materials with precision workmanship. New interior trim variants and instrument panel available in Sensatec. Optional glass roof with 100 millimetres longer transparent surface. Optimised acoustic properties: Foam-filled A-pillars and acoustic glass for the windscreen as standard, doors with acoustic glass optional. Extensively expanded range of driver assistance systems paves the way to automated driving: Collision and Pedestrian Warning with Braking function, plus Lane Departure Warning system, now standard. Optional Driving Assistant Professional comprises systems including Active Cruise Control with Stop & Go function, Steering and lane control assistant (which helps guide the car through narrow channels), Lane Change Warning system, side collision protection, evasion aid, Cross-Traffic Alert, Priority warning and Wrong-way warning systems. New generation of the BMW Head-Up Display also available. New ensemble of systems designed to make parking and manoeuvring easier is unmatched by any rival: Parking Assistant with automated longitudinal and lateral guidance for moving into and out of parking spaces, Reversing Assistant, Park Distance Control, rear view camera and 360-degree cameras. New BMW Intelligent Personal Assistant is an intelligent digital personality integrated into the car. No rival allows the driver to give such a system a name of their choice. The Personal Assistant is an expert on the car and also responds to natural voice commands to help the driver with numerous tasks, such as enhancing productivity and on-board entertainment. Thoroughly revised control and display system: Standard specification includes instrument cluster with screen size increased from 2.7 to 5.7 inches and Control Display with screen diagonal up from 6.5 to 8.8 inches. Optional BMW Live Cockpit Professional comes with a fully digital 12.3-inch instrument cluster and 10.25-inch Control Display with consistently designed, situation-linked and customisable displays. 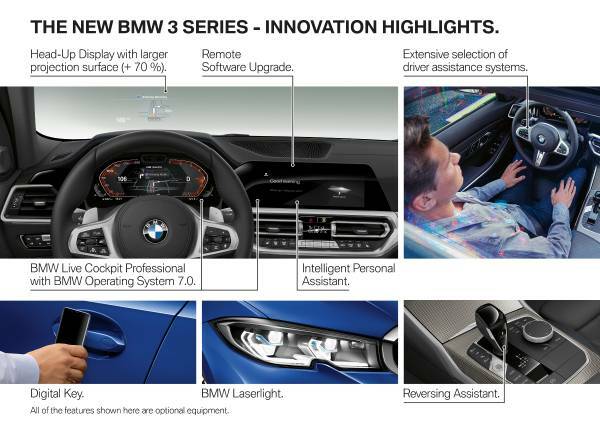 New BMW Operating System 7.0 also optimises intuitive operation through multimodal operation (by touch with the Control Display, using the iDrive Controller or steering wheel buttons, and with gesture control or voice control). Significantly expanded range of digital services from BMW Connected and BMW ConnectedDrive: Remote Software Upgrade keeps the car up-to-date. Parking Space Assistant makes looking for a free spot easier. BMW Digital Key for accessing the car and starting the engine via smartphone. * The fuel consumption, CO2 emissions and electric power consumption figures were determined according to the European Regulation (EC) 715/2007 in the version applicable. The figures refer to a vehicle with basic configuration in Germany. The range shown considers the different sizes of the selected wheels/tyres and the selected items of optional equipment, and may vary during configuration. The values are already based on the new WLTP test cycle and are translated back into NEDC-equivalent values in order to ensure comparability between the vehicles. With respect to these vehicles, for vehicle-related taxes or other duties based (at least inter alia) on CO2 emissions, the CO2 values may differ from the values stated here (depending on national legislation. Further information on official fuel consumption figures and specific CO2 emission values of new passenger cars is included in the following guideline: 'Leitfaden ΓΌber den Kraftstoffverbrauch, die CO2-Emissionen und den Stromverbrauch neuer Personenkraftwagen' (Guide to the fuel economy, CO2 emissions and electric power consumption of new passenger cars), which can be obtained free of charge from all dealerships, from Deutsche Automobil Treuhand GmbH (DAT), Hellmuth-Hirth-Str. 1, 73760 Ostfildern-Scharnhausen and at https://www.dat.de/co2 . *All figures relating to performance, fuel/electric power consumption and emissions are provisional. Όντως έτσι είναι, αλλά πολύ πιο ελαφρύ! Όλες οι εταιρίες αυτό κάνουν, μεγαλώνουν διαρκώς τα αυτοκίνητά τους ώστε να δημιουργήσουν χώρο για μικρότερα. Η νέα BMW Σειρά 3 Sedan. Η BMW Σειρά 3 Sedan είναι η επιτομή της σπορ οδηγικής απόλαυσης στην παγκόσμια premium μεσαία κατηγορία επί 40 και πλέον χρόνια. Με δυναμική σχεδίαση, ευέλικτη συμπεριφορά, εξαιρετική απόδοση και καινοτόμα στοιχεία εξοπλισμού, παίρνει τις κλασικές αρετές μιας BMW και τις προάγει σε νέα επίπεδα. Έβδομη γενιά του παγκοσμίως επιτυχημένου ‘πρεσβευτή’ της οδηγικής απόλαυσης στην premium μεσαία κατηγορία. Νέα BMW Σειρά 3 Sedan με αναβαθμισμένες σπορ επιδόσεις, νέα σχεδιαστική γλώσσα, εκτενείς βελτιώσεις στο εσωτερικό και πρωτοποριακές τεχνολογίες υποστήριξης, ελέγχου και λειτουργίας και συνδεσιμότητας. Παγκόσμια πρεμιέρα τον Οκτώβριο του 2018 στο Mondial de l’Automobile στο Παρίσι, στην αγορά αναμένεται από το Μάρτιο του 2019. Νέα τεχνολογία κινητήρων με υψηλότερη ισχύ, ροπή και απόδοση. Έξι εκδόσεις κινητήρων διατίθενται στο λανσάρισμα: Τετρακύλινδρα μοντέλα βενζίνης, τετρακύλινδροι κινητήρες diesel, και εξακύλινδρος κινητήρας diesel – με ισχύ από 110 kW/150 hp - 195 kW/265 hp (κατανάλωση καυσίμου στο μικτό κύκλο: 5,8 – 4,2 l/100 km, εκπομπές CO2 στο μικτό κύκλο: 132 – 112 g/km)*. Ευφυής τεχνολογία τετρακίνησης διατίθεται με το λανσάρισμα στην BMW 320d xDrive Sedan (κατανάλωση καυσίμου στο μικτό κύκλο: 4.8 – 4.5 l/100 km, εκπομπές CO2 στο μικτό κύκλο: 125 – 118 g/km)*. Αργότερα, ένα σούπερ σπορ μοντέλο BMW M Performance και μία έκδοση BMW iPerformance με plug-in υβριδικό σύστημα κίνησης θα προστεθούν στη γκάμα. Ακόμα πιο σπορ δυναμική συμπεριφορά με εκτενώς αναβαθμισμένη τεχνολογία πλαισίου, νέα τεχνολογία αποσβεστήρων, πιο άκαμπτη δομή αμαξώματος και βάσεις ανάρτησης, φαρδύτερα μετατρόχια, ελαχιστοποιημένο βάρος, χαμηλό κέντρο βάρους και ομοιόμορφη κατανομή βάρους 50 : 50. Περισσότερες επιλογές συστημάτων πλαισίου για πρόσθετες σπορ δυνατότητες: Χαμηλωμένη ανάρτηση M Sport, Προσαρμοζόμενη Ανάρτηση Adaptive M, σπορ σύστημα διεύθυνσης με μεταβλητό λόγο υποπολλαπλασιασμού, φρένα M Sport, ηλεκτρονικά ελεγχόμενο διαφορικό M Sport για πλήρως μεταβλητή ‘εμπλοκή’ των πίσω τροχών, ζάντες αλουμινίου έως 19-ιντσών. Νέα ερμηνεία του ‘σπορ sedan’ της BMW, βασισμένη στη νέα σχεδιαστική γλώσσα της μάρκας. Καθαρές γραμμές και σφριγηλές επιφάνειες αναδεικνύουν τη μοντέρνα αισθητική, το σπορ χαρακτήρα και τη γεμάτη συναίσθημα παρουσία του αυτοκινήτου. Εκδόσεις Advantage, Sport Line, Luxury Line και M Sport επιτρέπουν την απόλυτη εξατομίκευση. Βελτιστοποιημένη αεροδυναμική. Συντελεστής οπισθέλκουσας (Cd) μειωμένος από 0,26 σε 0,23 (BMW 320d). Η πρόοδος επιτυγχάνεται με χαρακτηριστικά όπως, ενεργός έλεγχος γρίλιας αεραγωγού, Air Curtains και ένα σχεδόν πλήρως στεγανοποιημένο κάτω τμήμα αμαξώματος. Ο στάνταρ εξοπλισμός περιλαμβάνει προβολείς full-LED και σκούρα πίσω φώτα LED. Προβολείς LED με περισσότερες λειτουργίες, προβολείς Adaptive LED με BMW Laserlight για αντιθαμβωτική δέσμη μεγάλης σκάλας (με εμβέλεια περίπου 530 m) και εμπρός προβολείς LED διατίθενται προαιρετικά. Πιο οδηγοκεντρικό και ανανεωμένο, premium περιβάλλον εσωτερικού. Σαφής διάταξη χειριστηρίων, ακριβής χρήση φορμών και λεπτομέρειες υψηλής ποιότητας μεταφέρουν μία αίσθηση σύγχρονου δυναμισμού και αποκλειστικότητας. Αυξημένη ευρυχωρία για ώμους και αγκώνες των εμπρός επιβατών, αισθητά βελτιωμένη πίσω ορατότητα, ευκολότερη πρόσβαση στο πίσω τμήμα της καμπίνας με περισσότερο χώρο για τα πόδια, χώρος αποσκευών 480 L με καλύτερη χρηστικότητα από του προηγούμενου μοντέλου. Διαιρούμενη 40 : 20 : 40 / αναδιπλούμενη πλάτη πίσω καθισμάτων. Αξιοσημείωτα επίπεδα άνεσης, πολυτέλειας και εξατομίκευσης χάρη σε εκτενείς προσθήκες στον στάνταρ και προαιρετικό καινοτόμο εξοπλισμό. Νέας σχεδίασης, σπορ δερμάτινο τιμόνι με πολυχειριστήρια, νέο πάνελ διακοπτών για έλεγχο φώτων. Νέα, φινετσάτη σχεδίαση επιλογέα σχέσεων και του πάνελ ελέγχου στην κεντρική κονσόλα – περιλαμβάνει iDrive Controller, διακόπτη start/stop, μπουτόν για το διακόπτη Driving Experience Control, και το νέο, ηλεκτρικό χειρόφρενο. Φώτα εσωτερικού LED στάνταρ, φωτισμός περιβάλλοντος με προαιρετικό Welcome Light Carpet. Radio Professional με έξι ηχεία, στάνταρ, ηχοσύστημα Harman Kardon surround με 16 ηχεία προαιρετικά. Δύο θύρες USB και διεπαφή Bluetooth στάνταρ, τηλεφωνία με ασύρματη φόρτιση, προαιρετικά. Νέας σχεδίασης καθίσματα για οδηγό και συνοδηγό, βελτιστοποιημένη άνεση καθισμάτων πίσω, νέα, προαιρετική δερμάτινη ταπετσαρία Vernasca. Υφάσματα υψηλής ποιότητας με ανώτερη κατασκευαστική ακρίβεια. Νέες εκδόσεις εσωτερικού διάκοσμου και ταμπλό σε Sensatec. Προαιρετική κρυστάλλινη οροφή με μεγαλύτερη διαφανή επιφάνεια 100 mm. Βελτιστοποιημένη ηχομόνωση: Κολόνες Α με πλήρωση αφρού και ακουστικό κρύσταλλο για το παρμπρίζ, στάνταρ, πόρτες με ακουστικό κρύσταλλο, προαιρετικά. Εκτεταμένη γκάμα συστημάτων υποστήριξης οδηγού προετοιμάζει το δρόμο για την αυτοματοποιημένη οδήγηση. Collision & Pedestrian Warning με λειτουργία Πέδησης, στάνταρ. Προαιρετικό Driving Assistant Professional περιλαμβάνει συστήματα όπως Active Cruise Control με λειτουργία Stop & Go, Steering & lane control assistant (που βοηθά στην καθοδήγηση του αυτοκινήτου από στενά περάσματα), συστήματα προειδοποιήσεων παρέκκλισης από τη λωρίδα κυκλοφορίας (Lane Departure Warning), αλλαγής λωρίδας κυκλοφορίας (Lane Change Warning) και πλευρικής σύγκρουσης (Side Collision Warning), Evasion Aid για αποφυγή εμποδίων, προειδοποιήσεις διέλευσης κυκλοφορίας (Crossing traffic warning system), Προτεραιότητας (Priority warning) και Λάθους κατεύθυνσης στον αυτοκινητόδρομο (Wrong-way warning system). Επίσης, διατίθεται νέα γενιά του BMW Head-Up Display. Νέα συστήματα σχεδιασμένα για να διευκολύνουν το παρκάρισμα και τους ελιγμούς, απαράμιλλα στην κατηγορία: Parking Assistant με αυτοματοποιημένη διαμήκη και εγκάρσια καθοδήγηση για είσοδο και έξοδο από χώρους στάθμευσης, Reversing Assistant, Park Distance Control και κάμερα οπισθοπορείας. O νέος BMW Intelligent Personal Assistant είναι ένας ευφυής, ψηφιακός βοηθός ενσωματωμένος στο αυτοκίνητο. Κανείς άλλος ανταγωνιστής δεν αφήνει τον οδηγό να δώσει σε σύστημα ένα όνομα της επιλογής του. Ο Προσωπικός Βοηθός (Personal Assistant) είναι ειδικός στο αυτοκίνητο και απαντά σε απλές, καθημερινές φωνητικές εντολές, για να βοηθήσει τον οδηγό σε διάφορα καθήκοντα, όπως βελτίωση της παραγωγικότητας και ψυχαγωγία στο αυτοκίνητο. Ανανεωμένο σύστημα απεικόνισης και ελέγχου: Ο στάνταρ εξοπλισμός περιλαμβάνει πίνακα οργάνων με μέγεθος οθόνης αυξημένο από 2,7 σε 5,7 ίντσες και Control Display με διαγώνιο οθόνης από 6,5 – 8,8 ίντσες. Προαιρετικό BMW Live Cockpit Professional με πλήρως ψηφιακό πίνακα οργάνων 12,3-ιντσών και Control Display 10,25 ιντσών με προσαρμοζόμενες και εξατομικεύσιμες ενδείξεις. Νέο BMW Operating System 7.0 βελτιστοποιεί τον έλεγχο για το χρήστη μέσω της οθόνης αφής Control Display, του iDrive Controller, τους διακόπτες στο τιμόνι, το σύστημα ελέγχου χειρονομιών BMW ή το φωνητικό έλεγχο. Σημαντικά διευρυμένη γκάμα ψηφιακών υπηρεσιών BMW Connected και BMW ConnectedDrive: Remote Software Upgrade φροντίζει για τη συνεχή ενημέρωση του λογισμικού. Parking Space Assistant διευκολύνει την ανεύρεση χώρου στάθμευσης. BMW Digital Key για πρόσβαση στο όχημα και εκκίνηση μέσω smartphone.